Bookle is a newly released EPUB reading app created by Adam Engst of TidBITS Publishing and Peter Lewis of Stairways Software. Its simple interface and built-in Mac gestures make Bookle an excellent way to read on your Mac. After you download and install Bookle it opens to Take Control of Bookle (TCB), a getting started guide on how to use Bookle. It’s not absolutely necessary to read it, but I think it’s worthwhile. You’ll get a hint or two (or three) out of it. For example, one of the things I immediately didn’t like about Bookle was there was no easy way to navigate to the next page without going to the Table of Contents. By reading TCB I found all I have to do is press the space bar. There are three ways to get an EPUB into Bookle: double click the book, use File > Open, or drag the book onto the Bookle icon. All books appear in the Library on the left side of the screen. Clicking on a specific book opens the Table of Contents. One thing to note about bringing books in the Library: Bookle copies the EPUB into Application Support/Bookle due to the Mac App Store’s sandboxing requirements. The original EPUB stays in its original location on your Mac. The current book being read appears in the larger window. Readers can customize each book’s font, size, and background color. Buttons on the upper left corner navigate back and forth for history and chapters, similar to the buttons on a web browser. If you click on a link that brings you to another section of the book, clicking the left triangle of the History button will bring you back to your previous location. Books in the Library are currently listed alphabetically. However, there are plans to add sorting based on author, title, date added, and other pieces of information. Bookle supports mouse, trackpad, gestures, as well as keyboard navigation for moving around. For readers who prefer to have their books read to them, Bookle will do that as well. Full instructions for setting up text-to-speech are included in TCB. Engst and Lewis realize Bookle is an unfinished product. 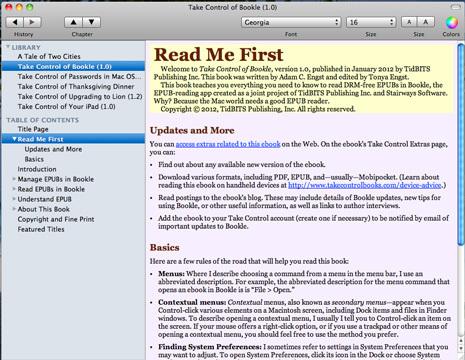 In a recent press release, Engst stated, “Bookle 1.0 is intentionally simple, both because an EPUB reader should be as easy to use as possible and because Peter and I wanted to get something out for Mac users to use right away.” Future updates will incorporate suggestions made by Bookle users. To see the list of comments, or to add your own suggestions, go the Bookle UserVoice forum. 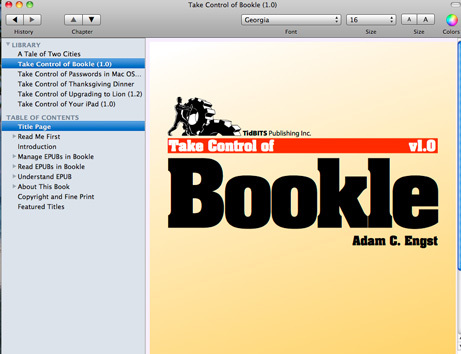 Bottom line: Bookle is a nice way to read DRM-free EPUBs on your Mac. I’d like to see a Bookle app for iPad since I prefer to read on that device rather than my computer. Bookle will be updated frequently based on customer feedback, so if it doesn’t have a feature you want, chances are it will be there soon. Bookle has the potential to be the go-to app for reading EPUBs on a Mac. MyMac.com Review rating: 7 out of 10 in its current version. Higher rating possible as the app progresses.